NIVEA Men Sensitive Protective Moisturiser is a moisturiser formulated for men with sensitive skin. It offers gentle protecting and soothing care for easily irritated skin. With SPF 15, it actively protects the skin from harmful sun rays, prevents it from drying out and moisturises deeply for long-lasting results. I received this for my hubby to try as part of the trial team and as far as I can tell he seems to love it. It's a lightweight cream that absorbs fast and doesn't leave him with greasy skin or cause him any break outs. Being fragrance free is a big plus too as he doesn't normally like products that have a strong scent to them. The tube is easy for him to use and dispense as much cream as he wants. I've also noticed that his skin is a lot smoother and less dry to the touch after he's been using this cream. Definitely something we'd repurchase later on. I purchased this Nivea men sensitive moisturiser for my husband after I discovered he was stealing all my expensive day creams. It's perfect for everyday use, leaving his skin smooth and well hydrated and soft to touch. The cream is also rapidly absorbed with no residue. The flip open lid is perfect for disturbing the right amount into his hand and doesn't leave me with "man mess" to clean up afterwards. Being fragrance free is also a bonus as a lot of men's products are strongly scented which he doesn't like. There are two things I'd like to see added/changed one being a higher spf level, and also anti ageing. Husband has wrinkles appearing but won't let me change his moisturiser since he loves it so much. Both my boyfriend and I use it. A great unscented moisturizer that feels light, doesn't irritate either of us and is a good price. My boyfriend has skin conditions so he is really fussy with what products he uses. added UVA & B filters are another bonus. My boyfriend tried to use this as he has sensitive skin, however he found that it was still irritating because of all the chemicals. He still prefers to use the lush moisturizers since they are more natural. Contrast to this, his friend has had a better experience with this so it does depend on your skin type. RESPONSE FROM NIVEA: Hi LisOnLife, Thanks for your feedback on the product. Sounds like it's definitely not the product for your boyfriend and he has done the right thing in not using it again. Everyone's skin is different and each reaction to a product is very individual. We are glad to hear though that he has found a product that works best for his skin. Thanks again. Nivea For Men Sensitive Moisturiser 75ml comes boxed. The moisturiser comes in a white and navy up down (lid base) squeeze tube with a click open swing lid. The Sensitive Moisturiser is for easily irritated skin. It is formulated with the Active Comfort System which is gentle on skin. The moisturiser is enriched with natural Pure Chamomile, Vitamin E and UVA & UVB filters, with regular use it reduces skin sensitivity. It's a moisturiser to be used daily to keep skin nourished and healthy. It is a white moisturiser with a thick cream consistency. The texture is rich, smooth and creamy. It massages well with skin absorbing the moisturiser easily. The moisturiser gives high levels of nourishment without leaving skin feeling greasy. It feels cool and refreshing to use and leaves skin comfortable and nourished. This is a good moisturiser for men, it absorbs well, feels lightweight and nourishes skin. I love the fact it has the UVA & UVB filters, I have a hard time in getting my partner to apply sunscreen, with this method at least he is getting partial protection. My partner uses moisturiser on a regular basis to keep his skin from drying out. Shaving, weather conditions, air conditioners and heaters can dry out his skin so using the moisturiser comes in handy, keeping his skin on track and healthy. He is not very forth coming with information about the product other than, "it does the job", hence my test trial use of the moisturiser. I received the Nivea For Men Sensitive Moisturiser as part of the massive BH, BIB prize pack. Thank you Beauty Heaven. 12 month use by after opening tag. Mr. Chocolatelace and I trialled (and is sure to repurchase) this product when we were first introduced to this product from the BH Trial Team. We absolutely love this as a basic daily moisturiser. As this moisturiser wasn't scented, we both decided to used the product as we both thought it was really a unisex product. I was a little worried however, as most men's products have previously made me smell like bad aftershave. The product comes in a handy 75ml tube, and the lotion is fluid, fragrance-free and very calming on the skin. I trialled it underneath my make-up and he trialled it as his daily moisturiser - both with great results. We found the moisturiser to be highly hydrating, soothing and absorbed quickly leaving no greasy residue. it was non-irritating to our sensitive skins. It was great as an everyday moisturiser, as it really helped to reduce the flakies, redness and irritation. B-i-B 2012- My partner loves this! Ok shame on me,but i didnt buy this for him. In fact,he came home one night with this because his mom bought a tube for him(i hope she doesnt think that i wasnt taking care of his skin.lol). He uses this product as an aftershave balm,funnily enough. He shaves his face first,then apply this whenever he likes. He claims it doesnt irritate his skin or making his skin feels very sensitive,especially after shaving.There are some nights he'll apply this before going to bed and it gets absorbed by his skin pretty quickly. I cannot stop touching and smelling his face everytime he applies this. This is a review written by MoonStone's partner. I like this product because it smells nice and make my face feel nice. The pump style is good too because I don't have to put my hands into a tub. I recommend this to other men to try. Hubbys review - Normally doesn't use moisturiser, just sunblock. I liked the way the products looks and the texture was light and my skin absorbed it straight away. There was barely a scent which is perfect for me. My skin didn't feel greasy or clamy. About a week of using the moisturiser I noticed my skin feeling smoother, partner noticed a difference. Didnt realise men needed care as much as women. What a little beauty! my hubby tried out the moisturiser and was instantly impressed, texture was good, soothed red areas, instantly moisturised and was fastly absorbed. hubby said his skin felt more smooth and supple and i noticed too instantly. hubby happy no frangrance, as he can get quite sensitive to smells (gives him headaches). My husband usually don't like moisturisers, he finds them thick, and leave his skin greasy and clogged. However this one was different. Although he said it was quite thick for a moisturiser, he said he it was light and absorbed super quickly and left no greasy after feel. It felt very comfortable on the skins and was excellent value. It didn't have any sun protection, but that didn't worry him. It's a great tube and was easy to dispense too. Nivea Sensitive Moisturiser comes in a tube with the trademark Nivea design. The tube isn't transparent therefore you can't tell how much of the product is left. The lid is a flip top making access easy. The product has no scent as mentioned on the packaging and left hubby's skin feeling hydrated and soothed. No greasy film was left on the skin which was a bonus. Good product for a great price. Thumbs up even from a no-product man! My partner VMan trialled and reviewed this product thanks to bh and Nivea for Men. He has sensitive skin and is 31 years old. VMan doesn't usually use products at all, he hasn't ever used a moisturiser for his face as long as I've known him. He was very reluctant to try this but agreed to do so for the review. As with the other Nivea for Men Sensitive Protect range, the packaging is simple and masculine. This moisturiser also comes in the squeezable plastic tube, which he thought was better than the glass bottle for the post shave balm. The moisturiser was a thick liquid consistency and he enjoyed the texture, which was cool and silky on his skin. He put some on his hands and applied it to his face. The moisturiser was easily absorbed and very lightweight, leaving no greasy feeling or discomfort. He said he couldn't really detect a scent and was happy about that as he didn't like the fragrance of the wash.
VMan said his skin felt softer and more comfortable after using this moisturiser. I also noticed that his skin took on a younger and less weathered appearance right away. I loved how it felt too and he was pleased that I enjoyed his newly softened skin. VMan said the moisturiser didn't make his skin irritated at all, in fact the extra moisture actually helped as his skin was no longer dry and itchy. Again he said he would recommend this product to other guys and thought that the cost was very reasonable. What surprised me is that it is not advertised on the front of the box, but the blurb on the back of the box says the moisturiser also contains UVA and UVB filters, which I was really happy about because VMan is often working outdoors and getting sunburnt - trying to get him to put on a sunscreen is like talking to a brick wall - so using this double duty product he will be protected without even knowing it! A really easy to use, simple moisturiser for even the "blokiest" men. Suitable for all skin types as it is so gentle. This is probably going to end up being a staple new product for hubby as out of all the products he trialled, this was his favourite! This totally fixed up hubby's flaky, dry and red, irritated skin immediently after applied. It absorbed straight into the skin and instantly refreshed his face both in appearance and feeling. Thanks for introducing this for my hubby to trial, it has totally made a difference to his skin for the better. 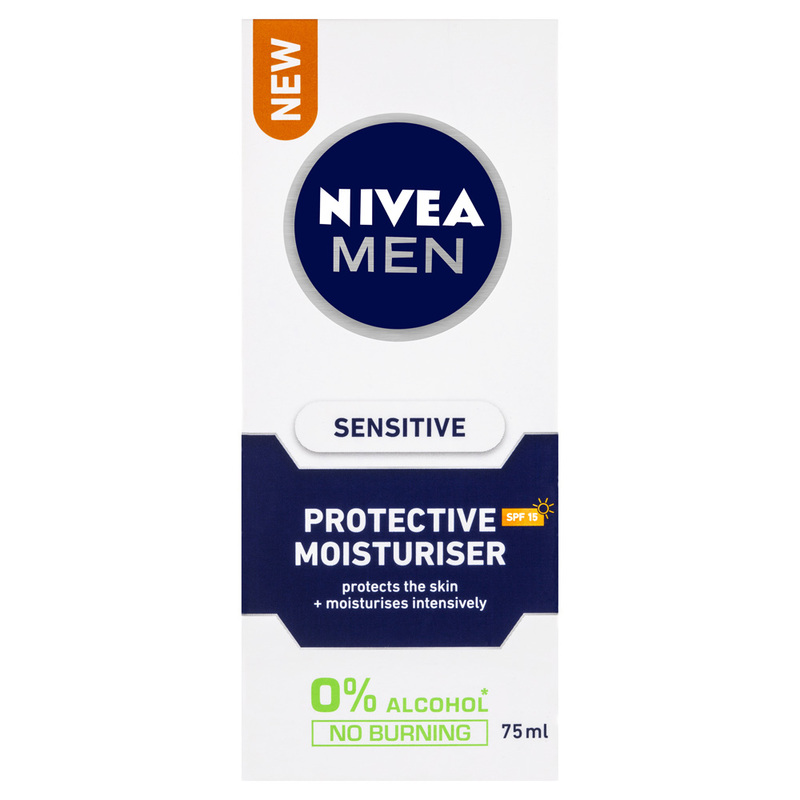 We are absolutely loving the new sensitive range from Nivea for Men. Hubby and I have both been trialling the range of products and we are both impressed! Hubby has dry sensitive skin and I have oily/combo sensitive skin, so I would never expect us to both like the same products and mostly, we don't. But this range is the exception. The cleanser and moisturiser have both suited us beautifully. The moisturiser comes in a 75ml tube for $11.60, great value! It has a flip top so is easy to use and the product dispenses easily and hygenically. It has no real scent and rubs into the skin easily. Hubby doesn't always shave everyday, so finds thick and heavy creams get suick in the bristles, but no such problem with this cream. It is moisturising enough for Hubby's dry skin, yet caused no greasiness on my oily skin. Nivea says it contains UVA and UVB filters, yet it doesn't have an SPF rating, which was a little confusing for me, so I would still recommend wearing a sunscreen if out in the sun. The moisturiser came in a 75mlL squeezable tube. It was blue and white with the words SENSITIVE visibly seen under the Nivea for Men logo. Hubby thinks the packaging would not attract his attention in the grocery aisle, but the austere design is probably because it's target market is for men with sensitive skin. He could not detect any scent from the product. The lotion was lightweight and easily absorbed in the skin which made it convenient to use. His skin immediately felt soft and he didn't feel the need to reapply during the rest of the day. The packaging says it contains UVA and UVB filters but did not specify a SPF rating which would be a concern during the spring/summer months. He's not one to regularly put a moisturiser AND a sunblock and I'm not sure if the filters would be enough to skip the sunblock so were not sure if we will purchasing it again for the warmer months. WIN prizes every day this week! Want to snag these tried and tested products for yourself? Enter now! Brought to you by beautyheaven.com.au.